Knee ACL surgery is performed in concert with arthroscopy to treat tears of the anterior cruciate ligament (ACL), located deep in the central portion of the knee joint. 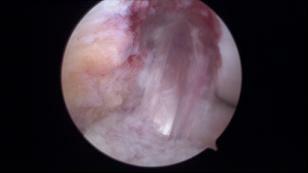 Frequently, this scenario can include meniscus tears , which must be repaired or removed as well. 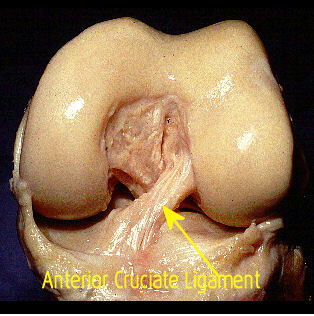 The picture below shows the ACL (cadaver) ligament well and its position in the knee. Less visible, is the posterior cruciate ligament (PCL) crossing behind it from upper left to lower right This is the typical pattern of how the ligaments relate to each other. 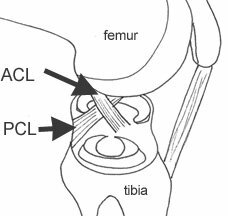 The “twin sister” to the ACL is the posterior cruciate ligament, or “PCL”. The two ligaments cross each other, from front to back, and serve to stabilize the knee against excessive “translation” either forward or backward. They, together with the collateral ligaments, also stabilize against excessive rotation of the knee. The illustration below shows the crossing pattern of the ligaments. As the knee bends and straightens, the respective ligaments become looser and then tighter. The opposite-effect positioning of the ligaments serves to maintain stability to the knee regardless of the amount of flexion (bend) or extension (straightening). Knee ACL surgery, or reconstruction, can be performed in an entirely “open” surgical exposure or, as is seen more and more frequently, performed as an “arthroscopically- assisted” procedure, in which case results in much smaller incisions, less overall surgical time, less pain and with better and faster recovery times than the more extensive, open approaches. The above photo shows a torn ACL, which has been detached from the femoral (thigh bone) side and has become thickened with a blunt, rounded end. The torn, non-functional cruciate ligament is typically replaced in one of two fashions: either by using tendon tissue from the patient’s own body, called an “autograft” or by utilizing tendinous tissue harvested from cadavers (dead people), called an “allograft”. These “grafts” are then fashioned into a configuration that can be inserted into specially prepared tunnels in the tibia (shin bone) and the femur (thigh bone) to re-create the mechanical function of the ligament as close to natural as possible. Examples of tendons used as replacement ACL grafts include the "hamstring" tendons (harvested from behind the knee) and the patella tendon, which is typically harvested to include bone segments from where the tendon attaches to the patella and tibia. 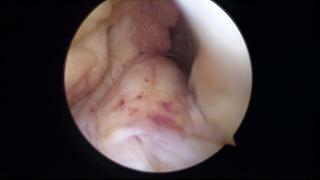 These "bone-tendon-bone" grafts are used frequently in young, high level athletes and often in revision cases. 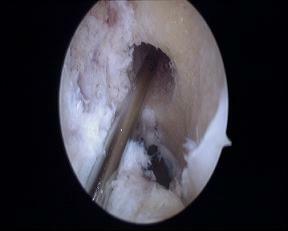 The photo above shows the femoral tunnel being prepared to accept the new graft. After knee ACL surgery, patients are typically placed into protective orthopedic knee braces which can gradually allow increased motion of the knee as recovery and rehabilitation progresses. Physical therapy begins within a few weeks of surgery and can last up to 3 months. Activity is closely monitored and resumed on a gradual basis. Return to high level sports is often allowed around 6-12 months after surgery, many times requiring the use of protective functional bracing.